Protein builds the muscles and tissues that help your body run. It also plays a critical role in fighting infections and carrying oxygen throughout your body. Parents of picky eaters -- or those with athletic children who need energy for high-activity sports -- might create protein shakes in an effort to ensure their children get adequate protein. Although the extra supplementation is unlikely to harm your child, most children’s regular diets already contain ample amounts of protein. Relying on these shakes as meal substitutes can potentially harm your child's health by depriving him of important nutrients found in whole foods. Protein shakes, sold as ready-to-drink shakes or as powders that you combine with milk, water or juice to make shakes, can seem like a good way to round out your child’s overall nutrition. They often come in child-friendly flavors, including vanilla, chocolate or strawberry, and manufacturers market many of the shakes to children. 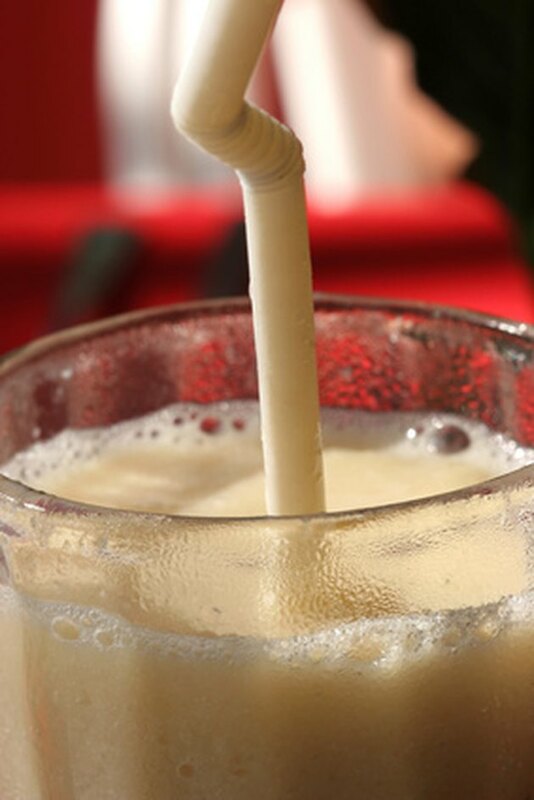 Despite protein shake manufacturers’ claims that they enhance nutrition or strength, ConsumerReports.org, the online portal of the consumer magazine, found that they are not a necessary part of a healthy child’s diet. Even if you want to give your child extra protein, there are less expensive and better ways to do so. The amount of protein your child needs depends on his age, body size, gender and activity level, but a good rule of thumb, according to the American Academy of Pediatrics, is that protein should make up about 15 to 20 percent of your child’s daily calories. According to the Kids Health from Nemours website, kids usually need to eat about 1/2 gram of protein for every pound of body weight. This means that a 70-pound child should eat around 35 grams of protein a day. Very athletic older children and teens might need up to a gram of protein per pound of weight to sustain their energy. Although athletes might need extra protein if they participate in strenuous physical exercise, the American Academy of Pediatrics advises against relying on protein supplements to provide this extra nutrition. They caution that no research shows that protein supplements improve muscle development, coordination or strength. Good whole food sources of protein include eggs, meats and fish. Vegetarian sources include nuts, dairy products, and legumes such as soybeans or lentils. Talk to your doctor about your child’s protein needs before giving him any types of supplements so he can provide advice and insight into your child’s dietary needs. Even though some people worry about overdosing on protein, pediatrician Dr. William Sears, author of “The Family Nutrition Book,” provides reassurance that this is unlikely to occur. Sears reports that an individual would need to eat twice the recommended amounts of protein on a long-term basis in order to experience any negative side effects. If your child did eat too much, her body would probably break the protein down and use it as an energy source or deposit it as fat. Sears emphasizes that too much protein is usually not a problem in children’s diets, but too little can be. Feeding your child nutritious, whole foods can be a less expensive and healthier alternative to relying on chemical-laden shakes to fulfill your child’s protein needs. The Center for Young Women’s Health staff at the Children’s Hospital of Boston recommends including these foods to ensure your child gets adequate protein: toast with peanut butter, string cheese, a tortilla roll-up made with scrambled eggs, cheese and salsa, hummus with carrots, turkey burgers and tofu or chicken stir-fries. If you choose shakes for your children, check manufacturers carefully, because some shakes might be contaminated with heavy metals, an especially big health risk for children. AskDrSears.com: How Much Protein Do I Need Daily?